Virtual Andover is an app for people who want to get out and explore the stories and history of Andover, Massachusetts. Open the App for walking tours to discover stories of Andover's people and places. From Main Street to parks and trails, you can find Andover's stories where they happened. 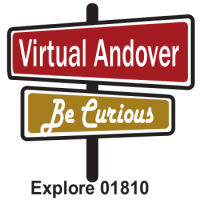 Even if you're not in Andover, you can explore stories using the Virtual Andover App. Where can you get the Virtual Andover App? Follow this link to download the app today! Visit the app often as we share new stories!